The Hasselback potato, a Swedish recipe has always been a very impressive potato recipe. This one is the chicken version, made with a filling of two cheeses and pancetta for that intense flavour. Made with the best roasted potatoes you will ever taste makes this combination a winner. Enjoy this easy Hasselback recipe. Also see Hasselback potatoes. Wash and peel potatoes. Add to a pot and cover with at least one inch of cold water. Add enough salt to water to season properly. Turn on heat and simmer potatoes until almost tender 10- 14 minutes. Poke a knife or skewer to test. While potatoes are boiling, finely chop the pancetta, add the ricotta cheese and grated Parmesan cheese. Add some grated nutmeg and pepper. Mix well until combined. Keep aside. When potatoes are cooked, strain in a colander and toss them until the outside start to fluff up. This will help soak up the juices and create nice roasting edges. To prepare the chicken, first coat by rubbing olive oil and season with salt. Cut 3 width-wise slits into into the top of each breast. For larger breast you can do 4 slits. Don’t cut too deep, two thirds of the way maximum. You don’t want to cut all the way through. Now using a spoon add some of the mixture by pressing into each slit. Remove the potatoes from oven, lightly crush using a potato masher to flatten. Add a drizzle more of olive oil on potatoes. 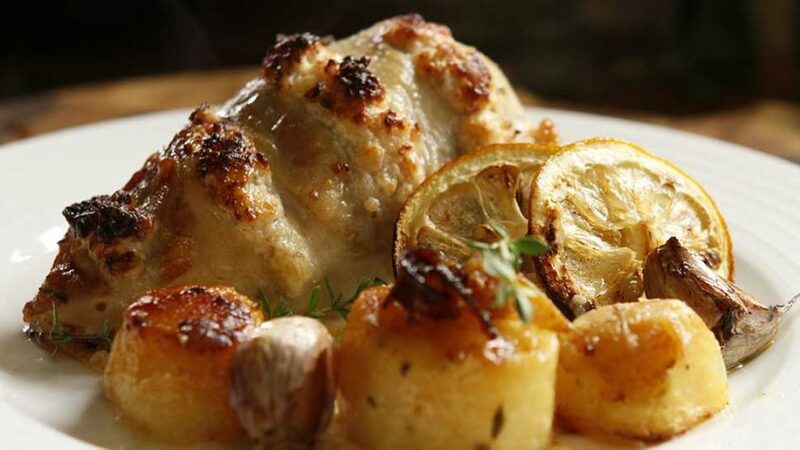 Place chicken breasts on top of potatoes and return to oven, bake for 30 min at 320°F – 160°C. Rest 10 minutes before serving. You can prepare the chicken breasts in advance, keep them covered and refrigerated overnight. If the bottom of your dish is starting to brown too fast on the bottom, potatoes could burn, add a cup of chicken stock or water to moisten.